For years, the media has been printing propaganda by farmers and growers warning about a veritable food Armageddon if they don't get all the cheap labor they want. The articles are just a scare tactic used because growers want a cheap, pliable labor force rather than employing legal workers at a good wage under good conditions. The self-styled reporters who write these articles invariably fail to ask growers any questions that might reveal that they're just engaging in scare tactics. For recent discussions of how these articles are deceptive, see "Another Phony Farm Crisis" (link) and "'Bitter Harvest' Watch: Time Magazine Edition" (link). 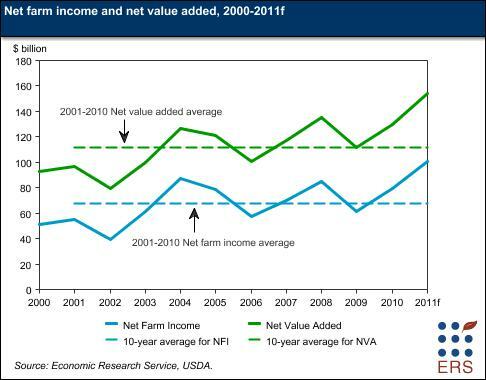 Chart showing overall farm income from 2000 to 2011 (estimated) from ers.usda.gov/Features/FarmIncome. That income has risen despite illegal immigration being at a low ebb. Click for a larger version. ...California Farmer reported in 1963 that if the flow of braceros stopped, tomato growers and canners "agree the State will never [again be able to plant] the 100,000 to 175,000 acres planted when there was a guaranteed supplemental labor force in the form of the braceros..."
In addition to the posts below, see the PIIPP propaganda articles, Jon Vessey, Western Growers, Tom Vilsack, and immigration agriculture. At NPR, Melissa Block offers the highly deceptive "'They're Scared': Immigration Fears Exacerbate Migrant Farmworker Shortage" . It was heard on All Things Considered, but one of the things not considered was such very pro-grower propaganda has been pushed for decades and it's always bogus. On his June 23 show, Keith Olbermann supported cheap, illegal foreign labor working in sometimes dangerous conditions rather than legal workers working for acceptable wages under safe conditions. And, he either fell for or tried to promote pro-illegal immigration propaganda. Drivers along the 5 Freeway through California's Central Valley are treated to signs saying, "Crops grow where water flows" or similar. Based on growers' support for illegal labor, perhaps they should consider throwing signs saying "Farmers hollowed when laws followed" into the mix. From "Farmers say 'enforcement only' immigration will cripple industry" by Eunice Moscoso: After the Sept. Various newspapers have printed an infinite series of propaganda featuring various growers complaining about how their crops are rotting in the fields because of a lack of cheap foreign serf labor. The latest in a long line of stories about farmers desperate for cheap foreign labor contains a public admission that should be a bit shocking and - if the Bush administration and most of Congress weren't corrupt - would result in an investigation. Russ Bynum of the AP offers today's article about crops rotting in the fields: "Effects of Crackdown on Illegals". It contains several quotes from Georgia farmers claiming that they'd go out of business if they couldn't hire workers. And, while they claim that all of them provide the proper documentation, they also admit that most of them are probably here illegally. Today's "crops might rot in the field if we don't get enough cheap illegal labor" article is offered by Dania Akkad of the Monterey Herald in "Farmworker shortage leaves growers fearing for crops". Previously in this series of propaganda: "More fretful farmers whining for you to pay for their labor". 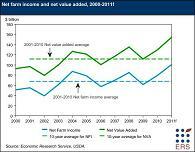 The N.C. Times' William Finn Bennett offers "Local farmers fret over rising cost of wages". From this: Thousands of migrant farm workers are here legally but many are here illegally. It was that portion of the migrant labor population that Canyon County Commissioner Robert Vasquez singled out for special attention today suggesting that the Mexican government should reimburse local taxpayers for their expenses.